Also visible in that screen is the problem: That yellowed plastic is incredibly weak, from exposure to the sun. (Whose idea was it to put non-UV-safe plastic in a window??). As soon as I pull on that tab, it’s going to come right off in my hand. And that’s exactly what happened to that one, and every other sun-facing window in our house. Amazon sells an assortment of replacement tabs, but the problem is that they must be installed under the bead. That means disassembling the screen, installing the tab, then reseating the bead while getting the screen nice and tight. I bought some white duct tape, and in the span of about 15 minutes, I installed new pull tabs on eight windows. Start by folding over about a half-inch of the end of the duct tape, then pull a length out to see how much you need to reach around the frame, and cut to length. Once cut to length, cut in half lengthwise, giving you two narrower tape strips. Apply those to the frame, leaving the doubled-over half-inch where the plastic pull tab used to reside, and you’re done. 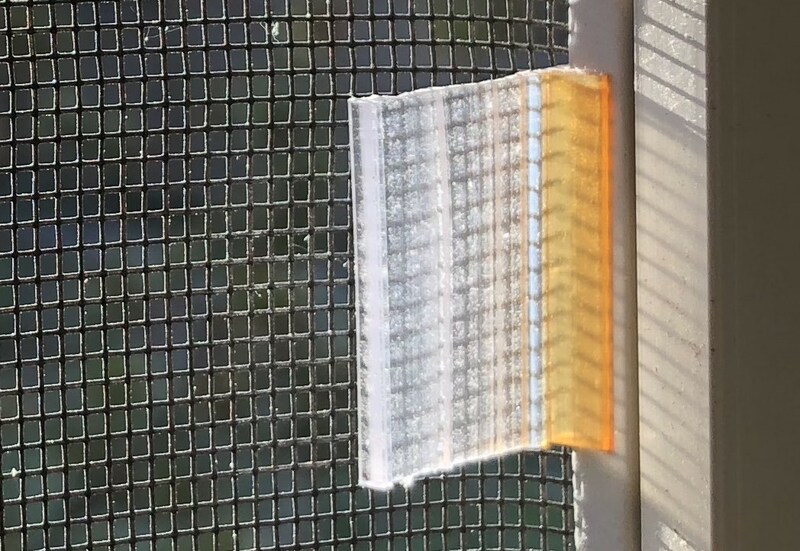 You might think you’d rip the tape off while pulling, but because the pressure is parallel to the window, it seems rock solid—I tested with one window about a dozen times, and had no issues at all. So much easier—and potentially longer-lasting—than ordering actual replacement tabs. I often use tape in small repairs, and in my experience, it usually doesn’t last long. The adhesive tends to dry out in a year or two, especially when exposed to the sun. And it leaves a nasty residue that requires solvent and a fair amount of scrubbing to remove, which is worthwhile if you intend to re-apply tape to the same area. All that said, I’d still probably make the same choice you did. My impression is that re-beading a screen takes a fair amount of skill that I’m not looking to develop. I figure our home’s builder used the cheapest windows that met the required energy saving code, hence the horrid pull tabs. I watched a few “replace your pull tab” videos, and while it looks doable, I also think it’d take me forever and I’m sure I’d wind up with a number of not-really-tight screens. Lesson learned: If I get involved in a remodel with window replacement projects, I’m specifying an up level screen, at least, so that I don’t have to deal with this again :). Forgot to add: I also think the glue may fail where it’s exposed to the sun. But a good chunk of it isn’t—it’s on the inside frame, and the portion in the channel. We’ll see—but even if it fails, it was a heck of a lot easier than redoing the tabs.